I need to setup appropriate reminders to categorize twenty “Uncategorized” posts a day until they’re all organized again, so I’m reinstalling the free version of Habit Streak on my Android phone. Habit Streak helps you achieve your goals (or New Year’s Resolutions) in exercise, diet or other areas of your life. Each day you report on whether you succeeded yesterday, building up streaks of habits and ingraining the activities into your life. I haven’t written about my Android in awhile, but I’ve been messing with it a bit more lately. The following has been rattling around in my head for the past few weeks. Please excuse the partial lack of structure. I prefer the default Android calendar app over the calendar app used from HTC Sense. The weekly view displays event descriptions. I also like the default Gallery app for viewing photos. I don’t see “Verizon Wireless” on the notification or lock screens anymore. There’s no built-in stopwatch or countdown timer, so I’ve installed Ultrachron Lite. 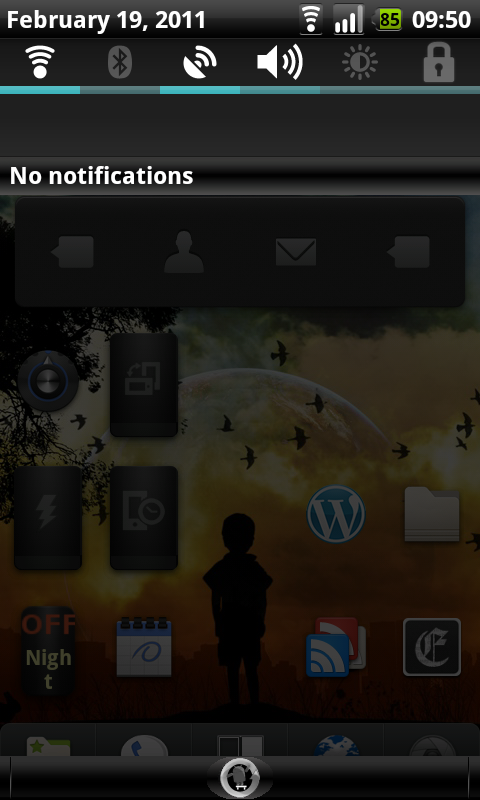 I have six power widgets in the notification screen, plus three on my [only] home screen. 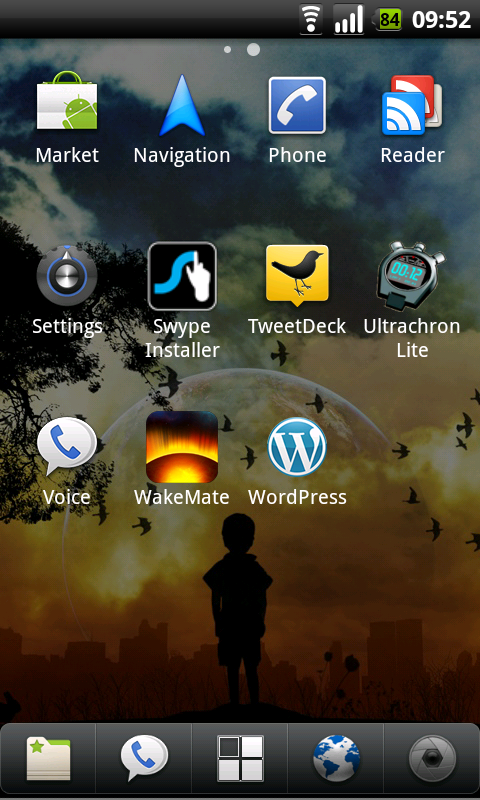 ADW.Launcher is the default launcher included. 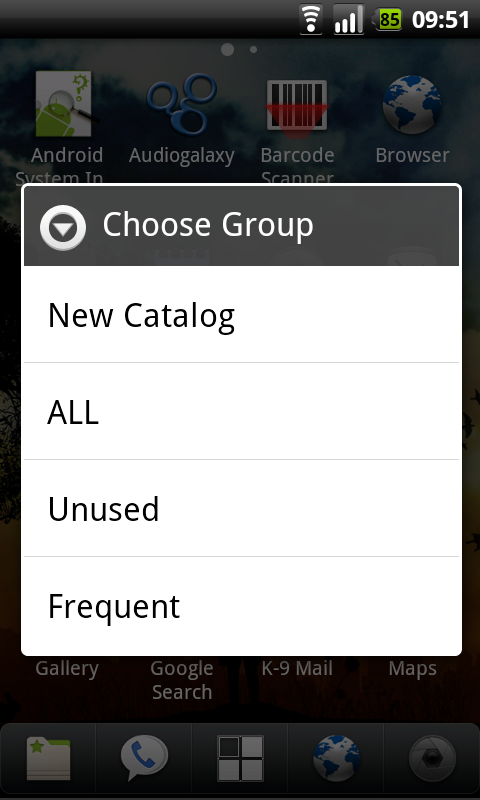 Compared to Zeam Launcher, it has more options, but I don’t necessarily need them all. I’m sticking with it for now. I don’t need Silent Boot or Silent Sleep anymore since (1) CyanogenMod doesn’t have a startup sound, and (2) CyanogenMod > Sound Settings allow me to configure quiet hours. I experienced a slew of FC errors while installing my first few apps. Using ROM Manager, under Utilities, run Fix Permissions. You can also reboot to ClockworkMod Recovery and fix permissions before you boot into the OS. 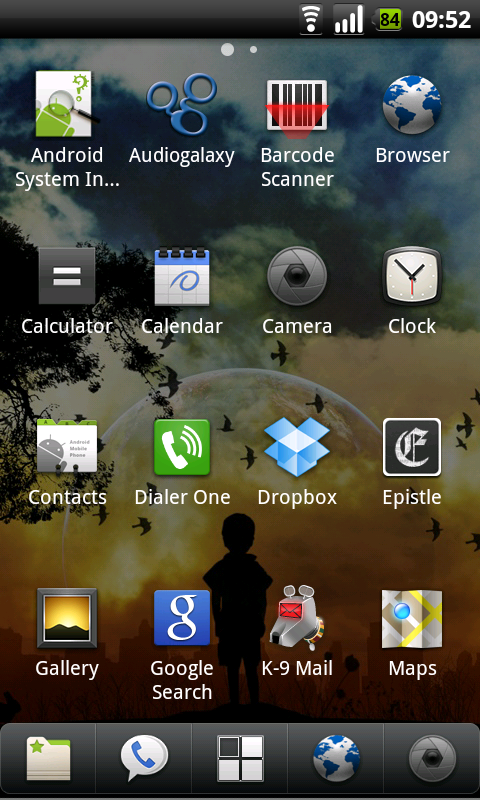 With a rooted phone, PicMe and ShootMe are two awesome screen grabber (screenshot) apps. Oh, and use Titanium Backup to uninstall apps you don’t want. (Why? I believe Twitter and Facebook were only included because of the Google Apps install. Oh, I nuked YouTube as well in favor of HTML5 videos.) No need for Terminal, unless that’s how you roll. I’ve given up on extending my battery life by means of software, such as JuiceDefender. Maybe I need more patience to configure it, but sometimes, I just want it to work. From what I’ve been reading across various blogs and websites so far, the iPhone holds that title. I’m going to buy an extended battery. I’ll be alright with the bulk. On a few work days, when I forced myself to use my computer for Google	Voice and TweetDeck, I didn’t touch my phone and it barely got to 85% after eight hours. Specific Android app-related posts to come. Sit tight. Overall, I’m very happy with the experience using my HTC Droid Incredible. I’ve had it for about ten days. Chrome to Phone – Opens links from Google Chrome on my desktop to my phone. 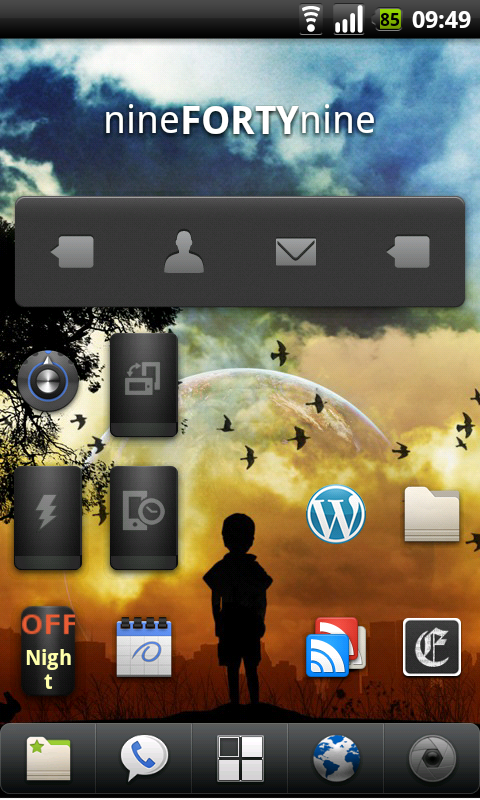 Clockr – A simple clock widget that displays text, not numbers. Dropbox – Along with Epistle (see the next item), this lets me save photos to any Dropbox folder, keeping my phone storage clear. Epistle – Synchronizes text files to/from a specified folder in your Dropbox account. Gmote – Control playback of videos and music, browse your file system, or use phone as a keyboard or mouse. Mint.com – View your balances and budget. Unfortunately, it doesn’t support adding cash transactions. Pandora [Radio] – I haven’t tried Slacker Radio yet. [Google] Reader – The formatting looks good. I prefer this over visiting the website on my phone. Silent Boot – Silences the “Droid” start up sound when powering your phone on. Stay discreet if you’re in a quiet room and need to restart your phone. Silent Sleep – Specify when your phone should be silent. Swype (Beta) – If you’re sick of tapping an OSK, you’ll love this app. I was comfortable using it after a couple days. I can write fairly quickly. TLDR – Saves articles for later reading directly to your Instapaper account. TweetDeck – More powerful than the official Twitter app. Google Voice – I heart this. WordPress – In case I want to draft/publish a blog post from my phone, this works very well. Skype – I might reinstall this if I needed. At the moment, I wouldn’t want to use it while I’m out and about. From what I’ve read so far, it’s only bad to have rampant apps installed if they constantly use your CPU in the background. The Android memory system is pretty solid. On Friday, I used my phone pretty heavily between classes. (TweetDeck, texting several friends with Google Voice, and Pandora.) It was unplugged between 7:00 AM and 1:45 PM. When I got home, my battery was down to 25%. I might have to try the bumb charge method outlined in this HTC forum thread, plus remove the calendar widget. I technically don’t need it. Actually, I should try one thing before trying another. That way, I know which factor was relevant. For now, the calendar widget is gone. Otherwise, I’ll upgrade to the Seidio Innocell 3500 mAh Extended Life Battery shortly. Note to self: With Auto-sync disabled and Background data enabled (Settings > Accounts & Sync), I still got notified of a text message through Google Voice. 06:15 — After charging all night, powered off phone, unplugged, then replugged the power cable. The orange light appeared, meaning the battery resumed charging. 06:45 — Green light from battery charging. 09:10 — Listening to Pandora Radio, checking TweetDeck, downloaded a few PDF files, and chatted with a couple friends through Google Voice (27 messages). My phone was on vibrate the whole time. For now, I’ve (sadly) uninstalled K-9 Mail and will resume using the built-in Mail app. I’ll resume my testing and publish a new post at the end of the week (so I don’t keep adding “clutter” to this).